← CBBH Photo Challenge: Looking forward, looking back. Gratitude and saying it with flowers! 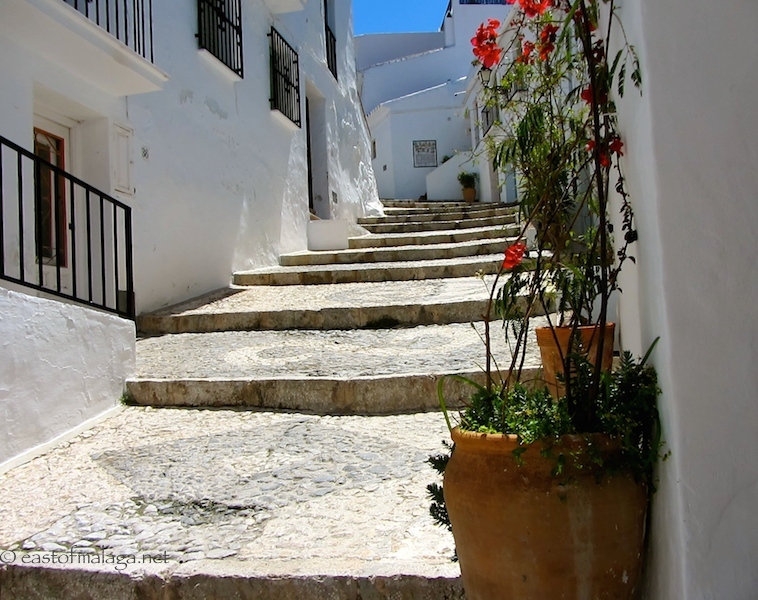 Last week, I went on a photo-shoot around the pretty, white village of Frigiliana. Can you see the little grey and white pebbles making up patterns on the steps? And the plaque on the wall at the top of the steps? Well, I’ll be telling you more about them soon, but for now I have a favour to ask. I’m delighted to tell you that my blog, East of Málaga, has been not only nominated, but shortlisted for a Brilliance in Blogging (BiB) Award 2014 in the PHOTO category – BUT I NEED YOUR VOTES TO GET THROUGH TO THE FINAL! If you click through to the Voting Form HERE and then scroll down to the PHOTO section – check the little bubble next to East of Malaga, and then scroll down to the bottom of the page and submit your vote. Last year more than 200,000 nominations and votes were cast – making it one of the UK’s most popular blogger awards. So, you can imagine how excited and honoured I am to have been shortlisted into the last 16 blogs in the PHOTO category. Tomorrow I’m heading to one of my favourite cities in Spain – Córdoba. Not only will I be re-visiting the amazing Mezquita, but the main reason for this visit is for the famous Patio Festival. Nothing says it’s Spring each year more than the many private courtyards within the city with are opened to the general public, to view the beautiful displays of flowers. It’s a few years since I last visited the Patios, so it will be quite a treat. I’ll no doubt be telling you all about that soon, too! **If you don’t already follow my FACEBOOK page, then you are missing out on lots of information and photos that I never post here on the blog. Come on over and say HOLA! This entry was tagged Andalucía, East of Malaga, Europe, fiestas, flowers, gardens, life, photography, Spain, travel, white villages. Bookmark the permalink. I’ve been enjoying your posts and have just voted for you. Good luck! I will be visiting Malaga and staying in Pedregalejo for the month of June and would love any suggestions for places to visit by bus. Places to visit: Obviously Malaga, but try to get to the east side of Malaga, too – including Nerja and Frigiliana. You might also want to visit Ronda, Granada, Seville and, of course Cordoba (see today’s post about the Patio Festival). We are already planning the train journey from malaga to ronda having been inspired by your recent trip. We will stay at the reina victoria. Good luck on your nomination! “Shortlisted” makes it even more special. And have a happy and safe travel. Love the whiteness. Something I noticed when I was in Spain, and do miss a lot. 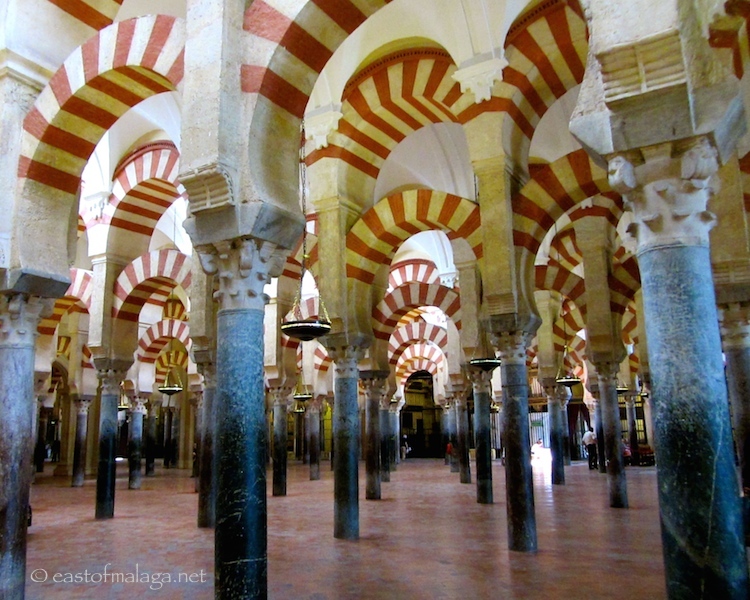 Ahhhhh … Cordoba and the Mezquita = magic! Lucky you! I’m off to vote right now and congrats on making it this far! Gorgeous shots and lovely perspective! Well deserved nomination. I’m on my way to vote. fingers crossed. Just cast my vote and have my fingers crossed for you, Marianne! Hoping to get lots more photos, over the next couple of days. Huge congrats, once I get home from work tonight I’ll head over and vote! Enjoy the patios! Very jealous! This is the first time in three years that I won’t be there! Really looking forward to you’re post on it! Huge congrats, again, wishing you the very best of luck!! Done and good luck Marianne you would / will be a well deserved winner. Voted with pleasure Marianne. Have a wonderful time in Cordoba. Vote submitted. Tick. About those geraniums in little pots all over the wall: I have one geranium in a pot and it’s doing very poorly. How do they keep them all alive and flowering up there on the wall? Great photos. I have the same problem, Trish – I really have no idea how they do it….. and they might not be willing to share their secrets – being as they are in competition with each other!